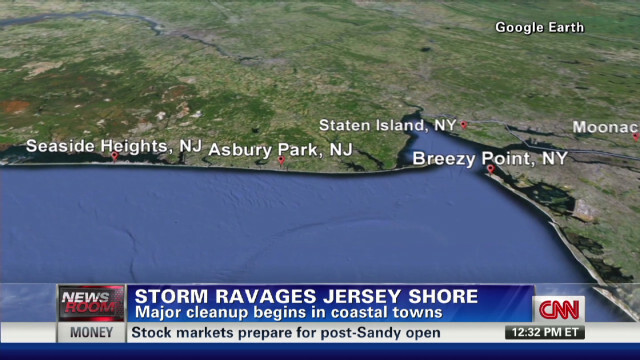 CNN’s Michael Holmes toured New Jersey’s barrier islands Wednesday, reporting on the devastation caused by Superstorm Sandy. “We’re the first of the media to get on to these barrier islands. I’m on Ocean Beach right now – I’ve got the ocean to my left and to my right is just as far as you can see damaged beach houses,” says Holmes. “There are sinkholes – we’ve noticed four or five of those, entire houses in the middle of the street…and for several blocks in from the beach, things are covered in sand. Michael Holmes anchors CNN International’s ‘International Desk’ program, and often appears on CNN/US during ‘Newsroom International’ and other programs. You can read more about him here and follow him on Twitter at @holmescnn.